Locally made arts and crafts. Purchasing locally made products, not only is environmentally friendly, it is also socially and economically friendly. It reduces environmental impact from transportation of goods, while at the same time, boosting the local economy. Antiques by there very nature are environmentally friendly because they have already been produced and would otherwise be discarded. Some antiques will increase in value over the years, thus your gift will grow in monetary value, assuming you do not mind them selling it down the road. You might be concerned about giving a used book as a gift, however, for the right person, an “out of print book” which can no longer be purchased new, can be a real treasure. First editions are valued by collectors. Like the above, this can only be given to the right person, somebody who appreciates things on a different level. Vintage clothing and jewelry come from a time when products were not mass produced and great care was taken in their creation. Locally made staples, such as jams and jellies. Fruit baskets from locally grown sources, assuming you live in the right climate for such, make terrific gifts too. As with locally made arts and crafts, transportation impact is greatly reduced. Plus you can get some very unique items this way. Most households consume batteries, then discard them in the landfill. Although rechargeable batteries do end up in landfills as well, their lifespan is longer, thus reducing this impact. As an added note, if you give a battery charger, make sure you give the right kind of batteries too. Although there is some concern about transportation impact, the benefits are that the rain forest needs to be kept intact so that these products may be harvested. After all, the rain forests are the lungs of the earth. If you are not familiar with this term, it refers to products made by indigenous peoples in other countries, often using sustainably harvested goods. Ideally, by providing these people with an income, they do not have to resort to clear cutting the forests to sell wood or poaching animals for income. Gift Certificates for garden centers. Planting a tree, or any thing may not be possible at Christmas time, especially if you live in the north. So this is a great idea for them go rush out and plant a tree in the spring. To be even more green, you can specify that the gift certificate is for a “fruit tree” of their choice. Live indoor plants for the home. 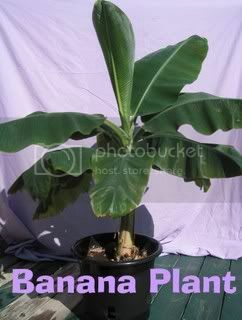 One interesting suggestion would be an indoor orange or small banana tree. Any house plant is good, they add color and help purify the air. “Green products” like solar lights and energy efficient light bulbs. Okay it might be odd to give somebody a light bulb as a gift, but if you do this right, as part of a gift basket, then it will be welcomed by the recipient who is looking to green up their home. There are also portable solar panels to be used with rechargeable power tools. Beeswax candles, and homemade, all natural, soaps. Even soy candles are a step up from the regular paraffin candle. Many times as well you can buy these from local flea markets or farmers markets and craft sales. Look for ones that contain natural ingredients only. Donations to “Earth Friendly” causes. Some people might be offended by this gift, but others will enjoy having a “tree planted in their name”, for example. Look around and see what is available in your area. Even a donation to a local charity may be considered more green than giving a person a product they do not want. When giving this type of gift, you may want to provide a token gift too, or a certificate for a dinner. Have a star named after the person. Like with the donation suggestion above, you may want to provide a token gift when giving this type of present. “Adopt” a zoo animal in their name. Not available everywhere, but for a concerned animal lover, this is a great idea. Again the token gift, of something they like, can accompany the card (printed on recycled paper of course). These are all really great ideas. You have something for everyone here. I will keep these in mind when I am shopping for that hard-to-buy-for person on my list. I ditto Darlene, I love the article ideas. My daughter went through Oxfam and paid for 100 children to have a school dinner each on my birthday, I got a box of trade mints with a picture to tell me about my gift, it was good for her pocket as she hasn’t got a lot of money and I loved the idea that 100 children were having a feast in my honour, she then did it again for her dad and a farmer got new equipemnt and my hubby got sweetpea seeds, the seeds were in flower when she came to Cyprus. This is a great list to print and use, thanks Mark. Good ideas. I think beeswax candles would be an awesome gift this year! I enjoyed all of your ideas! Keep up your good work! I do a lot of these, while the others I will keep in mind for any gift giving. Great Green Ideas here is another cool indoor plant idea. I found a coupon for a cool way to share your love of nature. Its called a TickleMe Plant and it is a real plant that you grow that will close its leaves and lower its branches when tickled. My students love it and 99% of the people that I give TickleMe Plants to have never had their own house plant that moves when tickled. You can get a TickleMe Plant Greenhouse to grow your own at http://www.ticklemeplant.com and use the coupon code HOLIDAY to get two dollars off. Great ideas! If you’re searching for a green gift for a beer lover, check out capcatcher bottle openers from http://www.capcatchers.com . They’re made in the US and use all local grown wood and recycled metal. And its a gift that the guys will love and actually use! its very amazing blog and very unique ideas to make our christmas greener. But its not always about christmas we must follow at least few tips in our day to day life. Really enjoyable blog.